Looking to do something different than the same old for your event? Having a shower or other event where everyone will be standing around? Maybe a wedding or reception where you don’t want kids to smear frosting all over their good clothes? Or maybe you just want something unique AND tasty. Any of these sound like you? Then you need to try Tracy’s Simply Sweet Cake Pops! Cake pops are simply “savory, bite-sized pieces of cake and icing, hand rolled into a ball, dipped into chocolate and served on a stick.” She sent me a dozen cake pops in both chocolate and white cake with various toppings. I didn’t know what to expect when she sent them since I’ve never had them before. In my mind, I kind of expected a cake texture with frosting swirled in. These were so much better! Simply Sweet Cake Pops have a thick, hard chocolate outside with a creamy textured inside. The inside is almost like a truffle and it in no way resembles cake or frosting on its own. She sent a variety of types and it seemed that I got 6 that were white and 6 chocolate. I got 3 kinds of chocolate, though. Two were regular chocolate, two had a hint of peanut butter and two tasted faintly of coffee, which was yummy even though I won’t drink it. My three year old loved them and they were fabulous in taste, texture, and were very easy to eat. There were only two very minor things that I didn’t like about them. First, I would have liked to have known what kind of Simply Sweet Cake Pops I was eating (flavor combinations). I’m that dork who looks at the top of the box of candy to find my favorites first, so that would have been nice. Second, was I would have liked to have storage/life directions in the package. She has that information on the FAQ page, but it’s more convenient to have it with the item. The Simply Sweet Cake Pops were shipped via Priority Mail and arrived on a pretty warm day and they were in perfect condition. She had a baggie with an ice pack in it to help keep it cool in transit. 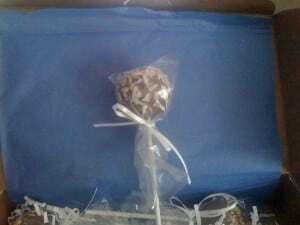 Each box held 6 cake pops immaculately wrapped and hand tied with REAL ribbon in a bed of gift bag quality shredded paper. I felt like I was getting a super special gift when they arrived and couldn’t believe how affordable they were! You can purchase Simply Sweet Cake Pops by the dozen in a box or in Mugs, Baskets, or even (assemble-your-own) Cakes and can pick a myriad of cake flavors including Lemon, Strawberry, Spice and Carrot. 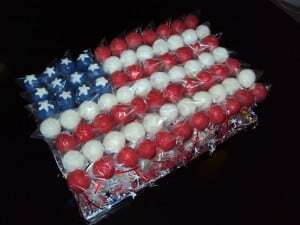 They are very affordable ranging from $15-24/dozen, depending on quantity and type purchased. 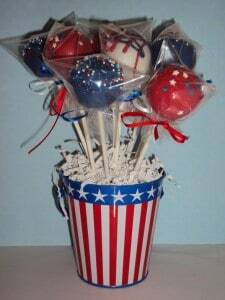 You can order Simply Sweet Cake Pops at her website. love love love the cake pop cones…too cute!! The chocolate scroll pops are really pretty. I like the Cake Pop Cones. I like the burger bites! I would like a cake pop cake. chocolate of course. The cupcake bites look so delicious and so cute. I would love for me and my family to be able to try them. cake pop cones look delicious! I love the burger bites! Cake pop cones are so cute and haven’t seen them before! I would like the cake pop cones. I want to try the Chocolate Peanut Butter cake pops! The cake pop cones are adorable! I like them all lol but I really like the Happy Birthday Cake Pops Mug. The cake pop cones my son would like! Chocolate peanut butter is my favorite. I like the Burger Bites best! I like the cute little Burger Bites. The Red Velvet Cake Pops are my favorite item. My favorite are the Cake Pop Cones! Favorite flavor is Chocolate Peanutbutter!